Inlay Bolo Tie by Jimmy Poyer! Very attractive sterling silver Bolo Tie with Turquoise, Onyx, and Spiny Oyster Shell inlay. 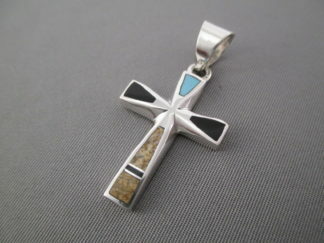 Made by Native American jewelry artist, Jimmy Poyer (Navajo). Bolo comes with a 38″ braided leather tie with sterling silver tips.